It is getting close to the official start of burger season. If you enjoy eating a burger, but want to try and stay away from red meat, a flavorful salmon burger is a great way to get your burger fix with all the benefits of eating salmon. You can forgo the bun and place the burger in a lettuce wrap, or serve it with grains, or place it on mixed greens. Top your burger with crunchy cabbage slaw, some dijon, and horseradish, and you have a delicious, nutritious, and simple springtime meal. If you have been trying to get more fish in your diet, but are tired of simply roasting, a burger is a great option. Mincing the salmon with a knife rather than pulsing it in the food processor is a manageable way to avoid the overly mushy, salmon pâté consistency that can occur when using a machine. Although a tad more labor intensive, the taste and texture is worth the extra effort. Instead of leaning on traditional flour as a binder, Bob's Red Mill Oat Flour served as a gluten-free and nutritious option to keep the patties together. When purchasing your salmon, opt for wild, the varieties are king, sockeye, and coho. Although more expensive, the flavor profile of wild salmon is superior to the farmed equivalent. Flavor aside, purchasing wild salmon is not only better for your body, but better for the environment. Farmed salmon are typically fed a diet that is far from what the fish would eat in nature, and usually consists of grain and GMO soy. Fish farms also use antibiotics and pesticides to help control parasites and diseases that break out due to close and confined living conditions. This means that the farmed fish which you are consuming contains antibiotics and other contaminants. Farmed fish can also escape and breed with wild fish, creating hybrid species in the wild fish population. Waste from fish farms also poses a threat to other marine life and to the ecosystem. If you have access to wild salmon, it is a worthwhile investment in your health and in the environment. Settle into spring with a flavorful salmon burger topped with crunchy cabbage slaw. For the salmon patties, combine the salmon, mustard, shallot, parsley, chives, cumin, ginger, oat flour, egg, salt, and pepper in a bowl. Gently fold together all the ingredients. Using your hands, form the salmon mixture into 6 even sized balls and flatten into 1 inch thick patties. Arrange the patties on a plate or a parchment-paper lined sheet tray. Cover and refrigerate for an hour. While the salmon patties chill, make the slaw. In a large bowl, whisk together the poppy seeds, vinegars, lemon juice, olive oil, salt, and pepper. Add the carrots, cabbage, and cilantro, and mix well. Taste and adjust, if needed. Let sit for an hour. The longer the cabbage marinates, the softer it will be. In a large cast iron pan, warm the oil over medium-high heat. Working in batches, sear the salmon burgers, 5 minutes a side, or until lightly browned on each side. To serve, smear some mustard and horseradish on both sides of a toasted bun, set a salmon patty on the bottom bun, and top with romaine, avocado, and slaw. Alternatively, serve in a lettuce wrapper, on mixed greens, or on top of your favorite grains. Enjoy immediately. This post was created in partnership with Bob's Red Mill. 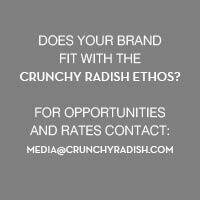 Thank you for supporting the brands that support crunchy radish! Check out more delicious healthy recipes, snag coupons, and find stores near you at Bob's Red Mill.